When the Marriage Equality referendum passed in May of 2015, Ireland’s dearest drag queen Panti Bliss took her place on the podium at Dublin Castle. Standing alongside Sinn Féin’s Gerry Adams and Minister for Justice Francis Fitzgerald, she addressed the emotional crowd. Rory O’Neill’s alter ego, Panti, who had always been in the peripheral vision of the Irish people, was now front and centre having played a hugely important role in the Yes campaign. Today, Panti performs all over the world but is based in Dublin, even making her own mark on the cityscape. 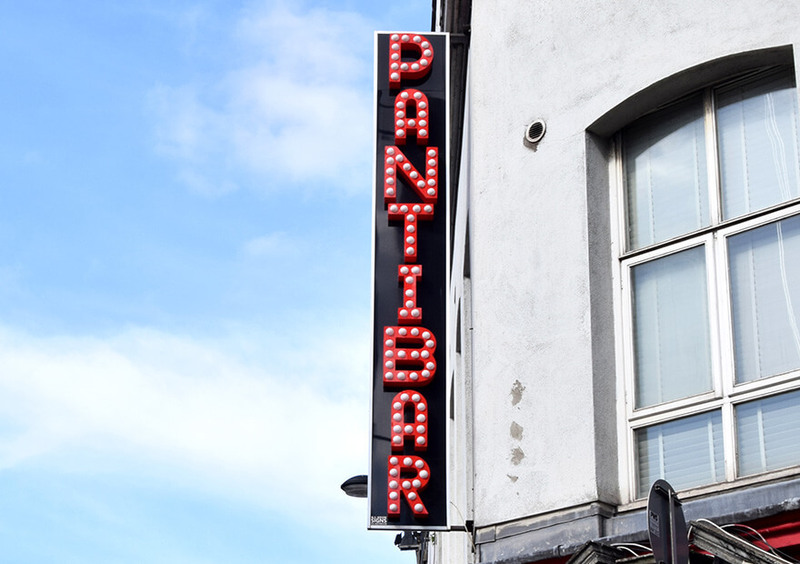 At dusk, the gloriously cartoonish PANTIBAR sign glows red and beacon-like on Capel Street, beyond it the Liffey ripples, the dome of City Hall pale green in the distance. But is Panti a Dubliner? After school, O’Neill moved to Dublin to study art in NCAD. He first performed in drag in his graduation show. Dublin in the mid-eighties was however a difficult place to be fabulous. O’Neill discovered the underground gay scene, but it wasn’t enough. After college, Rory left Ireland for Tokyo where his Panti persona made her debut. He stayed five years. “I adored Tokyo and had the best time of my life…but you’re always the foreigner there especially if you’re a big white guy…” When close friends moved on, it was time to go. Paris next, he thought. But when he came home to visit Ireland in 1995, things were different. For years, Panti has been a prominent figure in Dublin’s gay community, often leading the LGBTQ Pride Parade and emceeing Alternative Miss Ireland. So did she feel a certain responsibility to be at the fore of the Marriage Equality campaign? But then came Panti’s ‘Noble Call’ speech, and all was changed utterly. After O’Neill appeared on a late night RTE chat show to discuss the referendum, his words prompted a law suit. ‘Pantigate’ was born, and ‘Team Panti’ t-shirts and bumper stickers appeared everywhere. I got into drag because it was anti-establishment and discombobulating and transgressive and punk, you know, two fingers up to everyone’s expectations of how you should behave and dress. I still feel that way about drag too. Nevertheless, he balks at the idea of being an Irish hero. Having appeared as the eloquent Panti on the BBC and Channel 4 news, one wonders if O’Neill has done something to change the perception of ‘Holy Catholic Ireland’ on an international scale. But if he didn’t change things, the marriage referendum did, “that gets said to me all the time when I’m abroad: ‘Ireland, of all places’. These days, O’Neill has noticed that gay couples looked more comfortable being openly affectionate on Dublin’s streets. “I thought that very little would change afterwards. I thought if it was ‘Yes’ that everything would be exactly the same except gay people could get married. But actually I think it was much more powerful than that because we did it by referendum. It changed how the gay community feel about themselves in Ireland because, maybe uniquely in the world, Irish LGBT people, we know exactly how the rest of the country feels about us. We can quantify it. So how does O’Neill feel about the great evolution of Panti Bliss? “It’s hilarious,” he says. “I got into drag because it was anti-establishment and discombobulating and transgressive and punk, you know, two fingers up to everyone’s expectations of how you should behave and dress. I still feel that way about drag too. So to end up in a weird way being a kind of establishment figure, is just absolutely nuts.” But this progression suits O’Neill just fine. “I think it says something bizarre but kind of nice about Ireland, that that was even possible. I’m 48, and the kind of things I want to do have changed,” he says. And what of the people who ask if Panti would ever run for President?